Origin: This is a cultivar species and consequently has no natural distribution. It was developed by the Nursery Hans Bart in Dessau, Germany, by crossing Echinodorus uruguayensis and E. portoalegrensis. A specimen plant, suitable for the fore-ground in larger tanks to mid-ground in most tanks above and including 15/20 gallons. 20 gallon but preferably larger. Soft to moderately hard, slightly acidic to slightly basic water, temperature 22-29C/72-84F. This rather unique sword plant, which has been cultivated in aquaria since 1994 (Kasselmann, 2003), is a cultivar from a cross between E. uruguayensis and E. portoalegrensis; the cultivar name "Apart" refers to the spread of the leaves which is very similar to E. portoalegrensis, in that they do not grow erect but spread somewhat horizontally from the crown as will be seen in the photo below. The plant will grow up to 30cm/12 inches wide and up to 15cm/6 inches in height, larger than E. portoalegrensis. The leaves are tough and thick, and initially appear reddish-brown; as they mature the colour changes to a deep dark green. It will do better with a fertilized substrate and water column; CO2 is not required but will enhance growth if balanced with higher light and other nutrients. Like the parent species, this plant can be grown emersed (as in a plaudarium) or submersed. It reproduces via adventitious plants. The writer could find no information on flowering. The Alismataceae, or water-plantains, is a family of mainly herbaceous aquatic flowering plants growing in ponds and marshes; most genera are in the northern hemisphere, but Neotropical species in the Helanthium, Echinodorus and Sagittaria genera are of interest to aquarists. 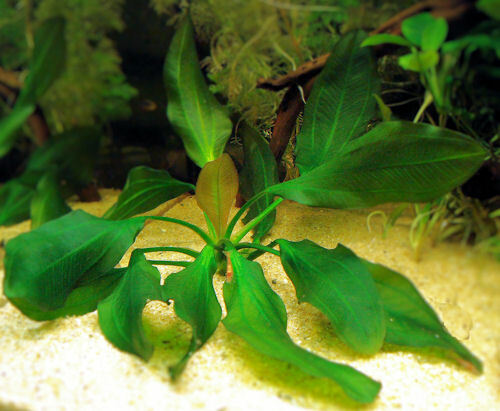 Some of the most beautiful and useful plants for the tropical aquarium are found among the Echinodorus, a genus distributed in the tropical and sub-tropical regions of the Americas from the lower United States down to Argentina; the two "African" species of Rataj are almost certainly erroneous (Kasselmann, 2003). The genus name derives from the Greek echinos [hedgehog] and doros [pipe or hose] referring to the spiny fruit. The English common name "sword plant" comes from the general lanceolate shape of the leaf of most species and is generally used for all plants in this genus although other non-Echinodorus plants may sometimes appear under the name "sword." A number of cultivars are now being cultivated in the aquarium, and it is possible that many assumed distinct species seen in the hobby may actually be cultivars that have not been properly labeled. Kasselmann, Christel (2003), Aquarium Plants, English translation, Krieger Publishing Company. Sweeney, Mary E. (2008), The 101 Best Aquarium Plants, TFH Publications, Inc.